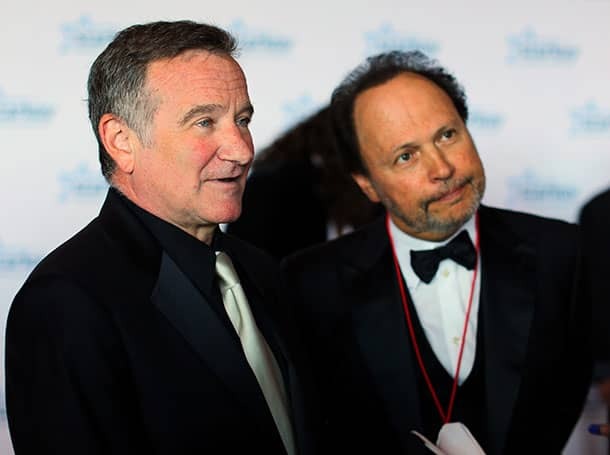 Robin Williams will be honoured at the 2014 Emmy Awards by his long-time comedian friend Billy Crystal. The late actor, who passed away from suicide in his California home on 11 August, will be remembered in the “In Memoriam” segment, which commemorates late actors who have contributed greatly to television. “We felt we needed to do something powerful and memorable,” said Emmy producer Don Mischer, as the red carpet was rolled out ahead of next week”s ceremony. Grammy-nominated recording artist Sara Bareilles will handle the musical accompaniment to the segment. On the day of Robin”s death Billy wrote “No words” on Twitter and has posted nothing since. The When Harry Met Sally actor had been friends with Robin for more than three decades. The pair took part in sporting television show Battle of the Network Stars in 1978, as well as an episode of Friends entitled “The One with the Ultimate Fighting Champion” in 1997. Their most famous collaboration was perhaps playing the leading roles in comedy Father”s Day, which was also released that year. Robin, who died at the age of 63, was involved in last year”s Emmy Awards ceremony when he paid tribute to actor and comedian Jonathan Winters in the “In Memoriam” segment of the evening. Jonathan had passed away in April of natural causes, aged 87. The upcoming 66th Emmy Awards ceremony will take place on Monday 25 August.